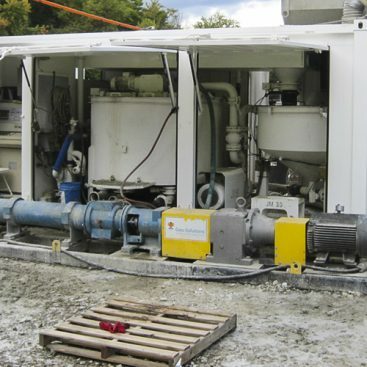 Previous work completed at this Superfund site by Geo-Solutions included installation of a soil-bentonite cutoff wall and shallow soil mixing for creosote impacted soil stabilization. 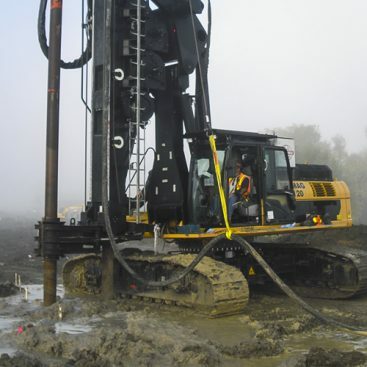 Geo-Solutions was subcontracted to complete an additional component of the specialty geotechnical construction portion of the American Creosote Works (ACW) Superfund site remediation. 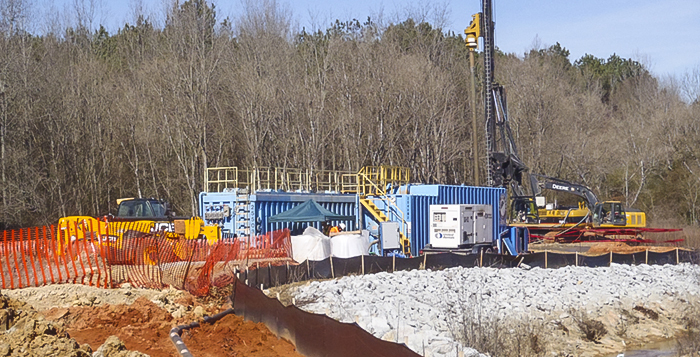 Geo-Solutions’ involvement in the work at this site started back in 2012 and 2013 when it was subcontracted to install a soil-bentonite cutoff wall and to stabilize creosote impacted soils using shallow soil mixing with Portland cement. The containment wall work scope included the installation of a 40 feet deep, 1,350 foot long barrier wall with a minimum width of feet. 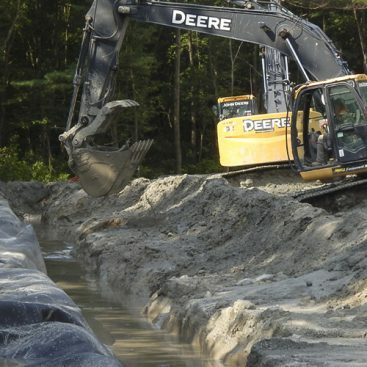 The containment wall was designed to have a maximum permeability of 1×10-6 cm/s to prevent the migration of creosote and creosote impacted groundwater offsite through lignite seams. 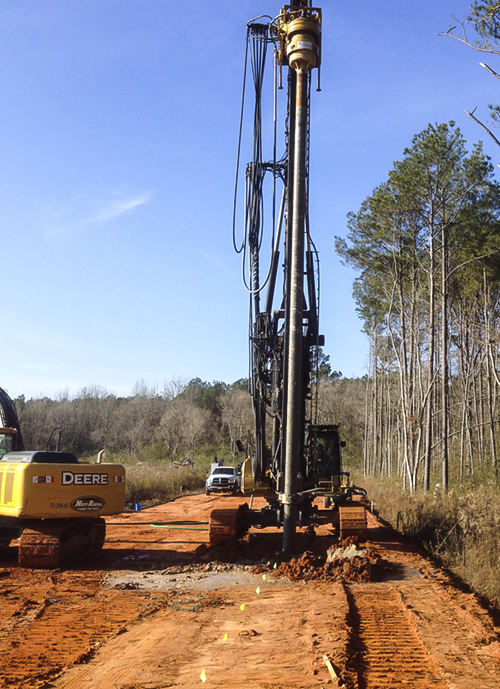 Geo-Solutions installed the containment wall with its Delmag RH-18 drill rig fitted with a 7 foot diameter auger. Geo-Solutions’ column to column spacing was selected to ensure the minimum wall width was achieved even when the auger deviated in opposite direction in adjacent columns. Installation and excavation of three test columns. Installation of 347 seven (7) foot diameter soil mixed columns. Maximum depth of 43 feet. Soil mix zone ranged in length from 20 feet to 23 feet. Achieved permeability values in the low 10-7 / high 10-8 cm/s range which was well below specified maximum. Work completed over 12 weeks, including 2 weeks of setup / tear down and a holiday shutdown period of 2 weeks. 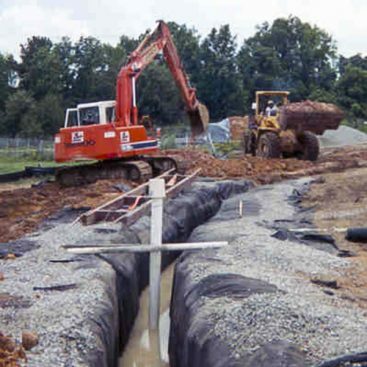 Ensure that the permeability of the target treatment zone, from 20 feet to 40 feet below ground surface, was below 1×10-6 cm/s.